Dilmah Tea: Fresh from the Garden to Your Cup! Twins Book Set Giveaway on TwinsTalk! LittleMissMatched Is Having Another Big Sale! Giveaway: Twins Books Times Two! Get a Free Box of Yummy Smucker’s Uncrustables! Take Your Family to a Museum This Saturday! Small Talk Six: Enjoying Autumn! Name a Frog and Win Big at The Bear Buckets Club! The 12 Days Til My Birthday Giveaway! LittleMissMatched Is Having a Labor Day Sale! 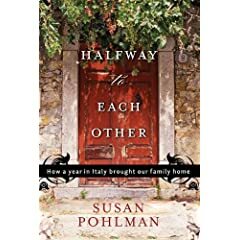 I was lucky enough to snag an early review copy of the book, Halfway to Each Other: How a Year in Italy Brought Our Family Home, by Susan Pohlman. I love reading about the adventures of people who relocate and adjust to daily life in foreign countries (Eat, Pray, Love and My Year in France were wonderful), so this book was perfect for me. And, thankfully, I enjoyed it as much as I had hoped! After 18 years of marriage and two children, Susan and Tim Pohlman were planning to divorce when they impulsively decided to give their relationship one last shot by leaving their comfortable lives in California and moving to a small village on the Italian Riviera. They sold their house, rented an apartment in Italy for a year, and left most of their possessions in storage. The kids, 14-year-old Katie and 11-year-old Matt, were pulled from their schools and friends to live in a place where they didn’t speak the language and knew not a soul. But the Pohlmans instinctively knew that this was their only chance to rediscover each other and the joys of family life. They were risking their financial security and a year of their lives, but they decided the potential rewards were worth the gamble. Not surprisingly, culture shock soon set in. They had to learn how to get around without a car (mostly via an incredibly unreliable bus system), figure out how to buy food where no typical grocery stores could be found, try to communicate when they knew very little Italian, and find entertainment without the electronic devices they had at home. Yes, plenty of things went wrong, and there were certainly tears at times, but in the end they all came to love their lives in Italy. When their year was up, and they were running out of money, they all dreaded the return to the hustle and bustle of their lives in the U.S. They had discovered that simplicity, togetherness, and love were all they really needed to be happy. Thank you for your wonderful review. I appreciate your taking the time to read our story and post this on your blog and on Amazon. It was my pleasure. I truly loved this book, and I wish you and your family all the best!